GREEN GHOST SAYS "VARIETY IS GOOD!" 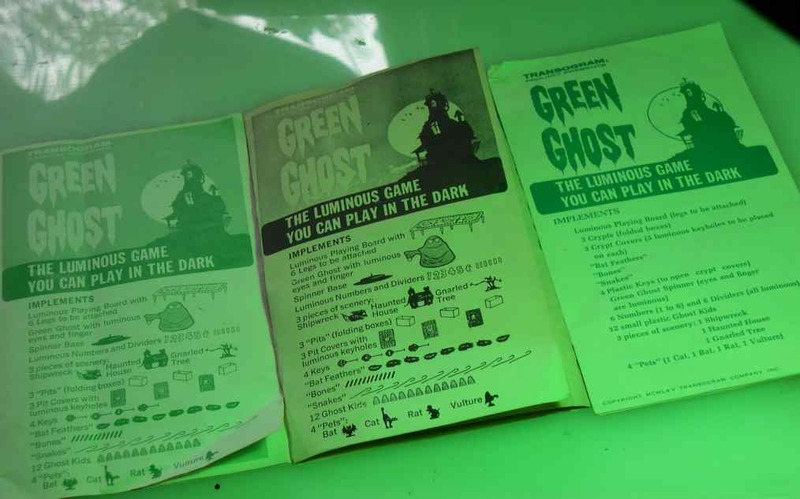 I have come across many different variations to Transograms Green Ghost Game. I think these variations are a result of where and when the game was made. The most marked variations come from Canada and the versions sold through Sears. Sears parts have different coloration. The green parts can be a darker green. Marx had mad a reissue of the game which has some variations as well. I now have a seperate page dedicated to the Marx version. The front graphics on the box will look the same. The Canadian version has some English and French print on the box. The Sears version has no front graphic.It's just white and may contian shipping labels. Sturgis Michigan, Sikeston Missouri, Canada and Australia. Sears also had its own version that came from New York. 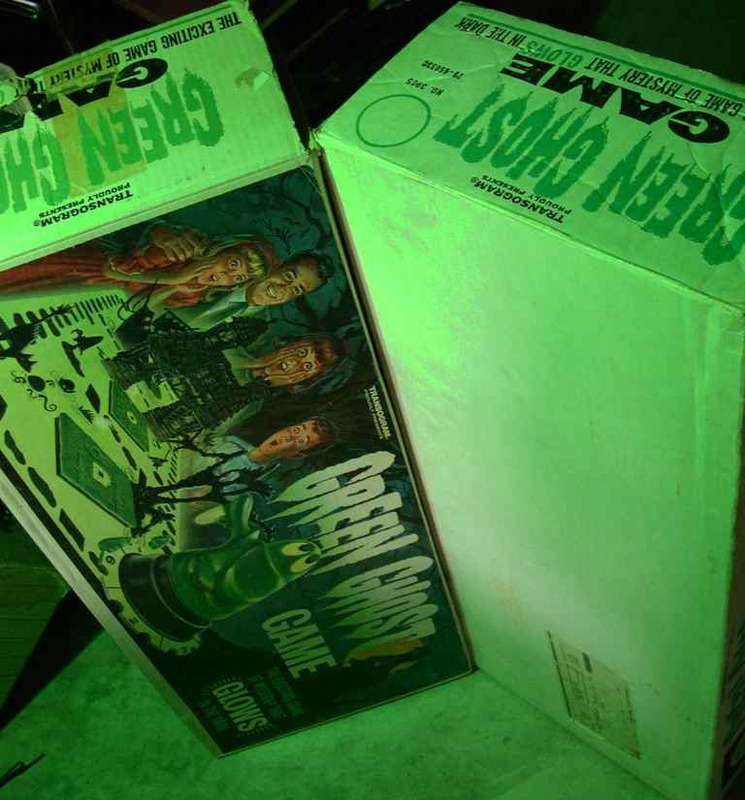 I have seen many different variations in the Green Ghost game boards. The most common I've seen is the white board with the red and green paint. The second most common I've seen is the green board with the red and green paint. I've seen less of the light green board with brown and green paint. 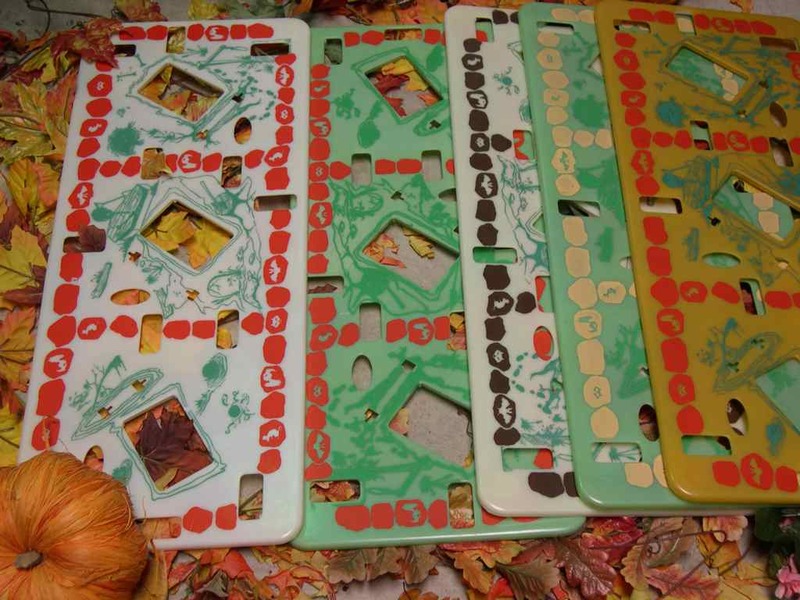 Also rare is the yellow and green painted boards. Some boards turn a Puke green color from age. Some boards are nice and sturdy while others are frail and flimsy. In a Green Ghost board line up I tested which game glowed best in the dark. Under carefully controlled conditions I exposed each board variation to the same light conditions. (Yes, I have a lot of time of my hands.) When I turned out the lights guess which one glowed the best? The white boards glowed much brighter than the green. After about 10 minutes all the boards held a solid glow, though the white still remained brighter. After a half hour there was a trace of a glow left in all but not much. Another thing to condiser is that some boards may loose their glow from acts of age, heat, use and fate by the glow gods. I think the Canadian version was more of a booklet with black printing. It had more pages because it was written in English and French. 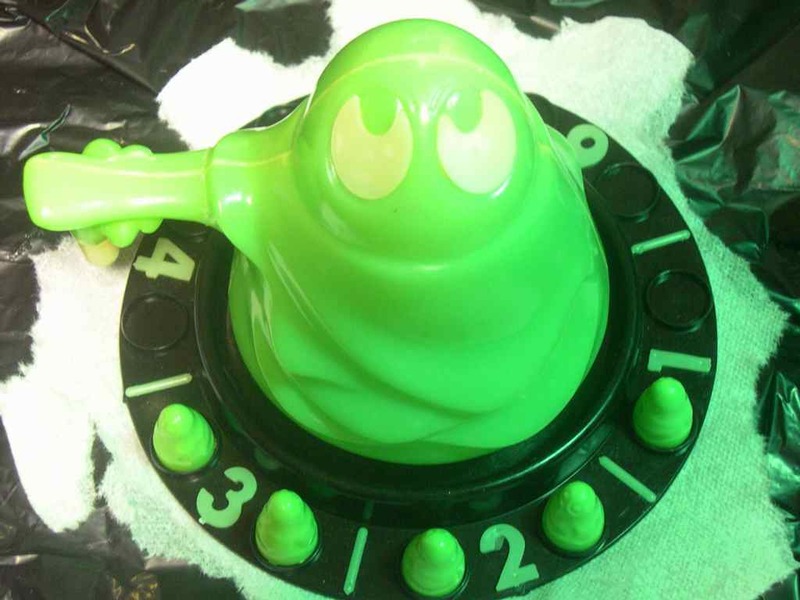 The Sears Green Ghost version was printed on heavier stock paper and is printed in black. 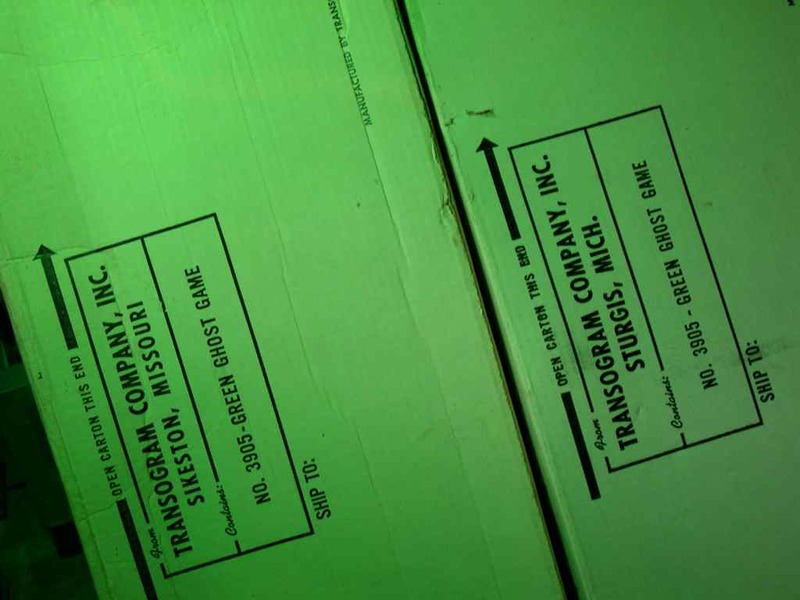 It's very hard to tell what is an official, original Green Ghost Transogram rubber band and what is not. 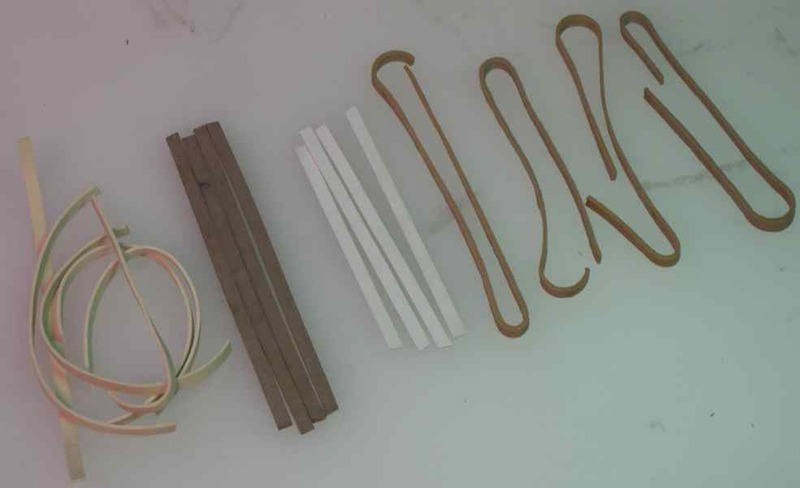 I have seen so many rubber band variations I have to admit even I am never 100 percent sure which is which. Sometimes the variation in color, texture and look is due to age, use, dirt, body oils and storage conditions. LENGHTH--- 3 and a half inches (standard). Canadian is 3 inches. Sears is longer: a whole rubber band cut on one end. COLOR---light and darker tan (standard). However the Canadian version has bright, white bands. The Sears versions I've seen are darker tan. The rubber band snakes were an unusual choice for a game piece. Unfortunately lots of these got lost, thrown out or stretched to death. Sometimes the rubber became so frail and dry that it crumbled. Some folks have replaced their snakes with household rubberbands. (You got to do what you got to do). However, if you are selling the game you should let the buyer know if your pieces are original or replacements. 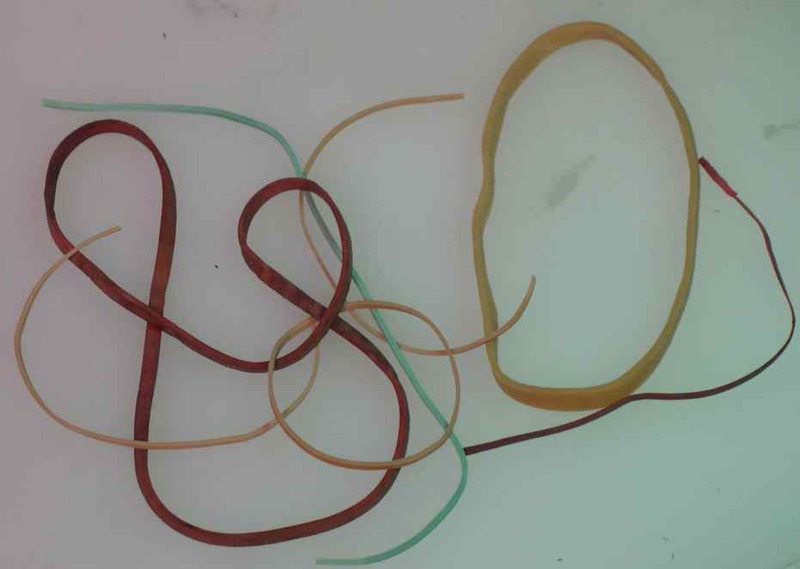 Sometimes it is very easy to tell what is not a Transogram issued snake, sometimes its not. Sometimes variations will be seen in Green Games due to aging. Game boards will show much variation due to age. I've seen puke green game boards and game pieces. I don't think they were produced this color from the factory. I think heat has played a factor in this "puke pea" green color. Age also colors and hardens the rubber in the snakes. Sometimes this aging is only cosmetic. Sometimes it is very damaging to the pieces.